In this tutorial, you’ll learn how to edit a PowerPoint footer. This is a very simply process. 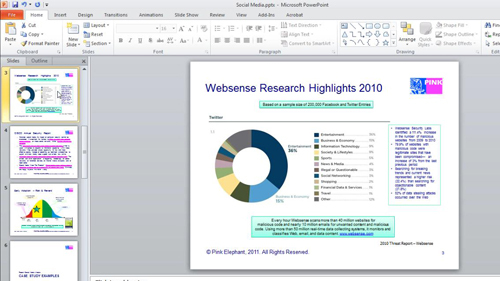 Start PowerPoint and make sure that you have the presentation open where you want to edit the header or footer. 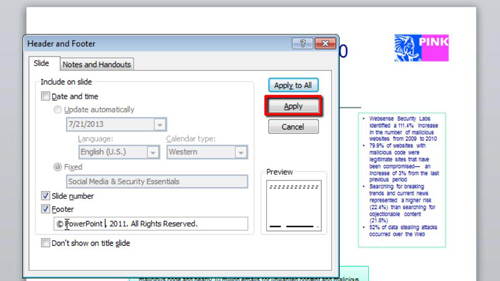 Choose the slide that you’d like to edit the header and footer for by clicking on it on the slide selection window. Next, click on the “Insert” tab, then go to the “Text” button, and click “Header & Footer”. Now go to the “Slide” tab and make your desired changes to the Header and Footer. Once finished, go ahead and click “Apply”. If you want to apply this change to every slide in your presentation, you can click “Apply to all”. That’s all, you now know how to edit a PowerPoint footer and header.